Organizing and filtering the spots from your favourite DX Cluster for DXing, casual Contesting or rag-chewing. MacLoggerDX supports more than a hundred radios, automatically tuning to the spots you are interested in, swinging your beam around. Alerting you to rare contacts or Band Openings and looking up, displaying on 2D, 3D and Satellite Maps and logging your contacts to a super fast sql database. MacLoggerDX can also text or email you when the Bands are open or that rare DX is spotted. Awards Tracking, Band Activity, Schedules, Memories, QSL Generation, ADIF import, export, Club Log integration, eQSL, LoTW, IOTA Confirmations and much more. Read what our customers are saying and download the free demo to try it yourself ! 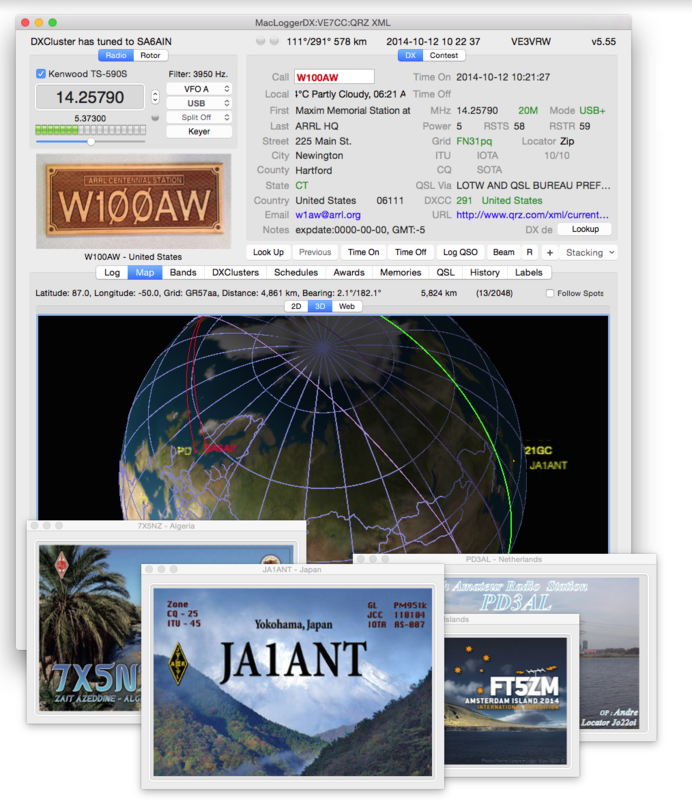 Integrated Real Time Club Log, QRZ Logbook, LoTW, HRDLOG and eQSL QSO upload, LoTW and eQSL Confirmations. 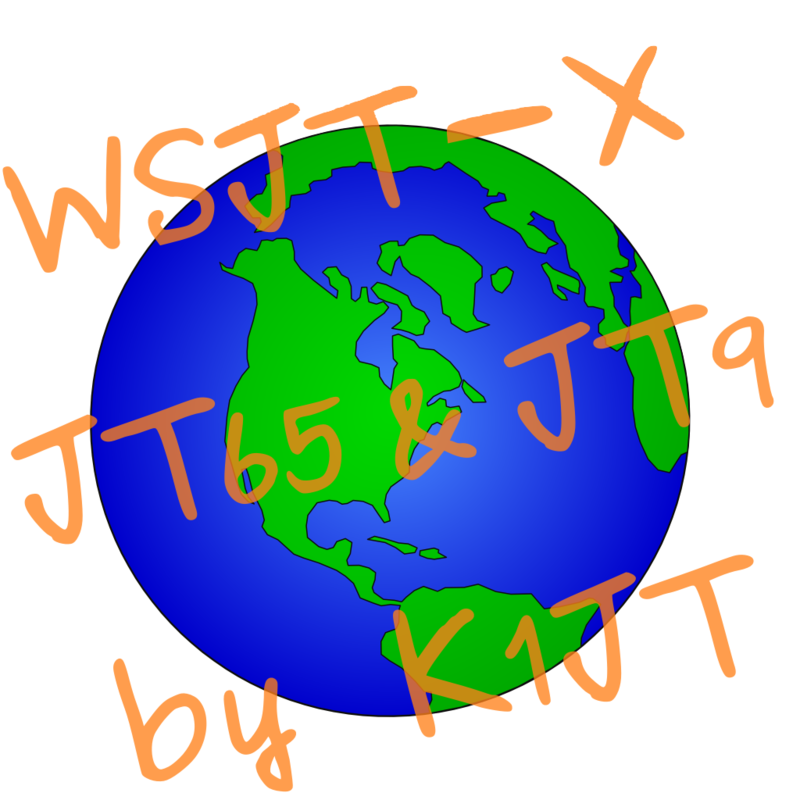 Log directly from WSJT-X, JTDX and automatically upload to Club Log, QRZ Logbook, LoTW, HRDLOG and eQSL. DX Lab Suite Commander TCP Radio CAT server for WSJT-X. 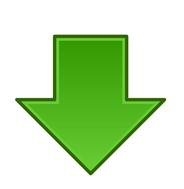 Internal databases updated daily over the Internet. Filtered DXCluster, WSJT-X, JTDX spots color coded for worked/confirmed status. CW Keyer Supports K1EL Winkeyer for Mac, and ZLP DigiMaster. Text To Speech and Record/Playback audio files keyer. Exports ADIF, SOTA CSV, KML, Imports ADIF, SOTA CSV. 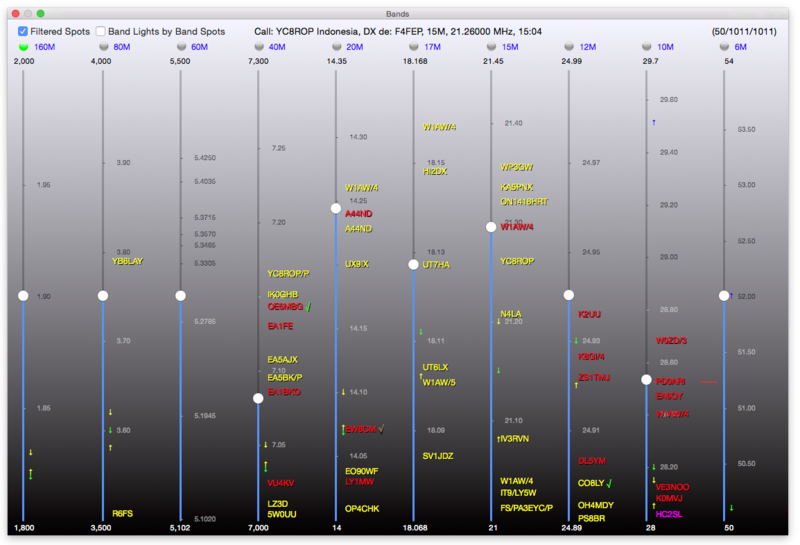 DX Alarms including Band Openings, specififc calls, missing DXCCs. Echo frequency over USB/Serial for amplifiers, SteppIR, etc. Label Printing - Address or QSO Details - sheet or Dymo. Contest Helper with K5ZD call completion and by-band Dupe Checking. SWL Schedules, Rig Control and Memory Scanning. Speed Log for entering old paper log and QSL card data. Online and built-in Mac Help. FlexRadio 6000 series LAN Interface, SmartSDR V3 not supported. Kenwood TS-50, TS-60, TS-440S, TS-450, TS-480, TS-570, TS-590S, TS-590SG, TS-670, TS-690, TS-790, TS-850, TS-870, TS-890S, TS-940S, TS-950S,TS-950SDX, TS-990S,TS-2000, R-5000. AOR AR8200, AR8600, AR5000, AR3000A, AR7030. Icom IC-703, IC-706, IC-706MkII, IC-706MkIIG, IC-718, IC-735, IC-736, IC-737, IC-746, IC-746Pro, IC-751, IC-756, IC-756Pro, IC-756ProII, C-756ProIII, IC-7000, IC-7100, IC-7200, IC-7300, IC-7400, IC-7410, IC-7600, IC-7610, IC-7700, IC-7800, IC-7850, IC-7851, IC-9100, IC-9700, IC-765, IC-775, IC-781, IC-910, IC-970, R71A, R75, R8500, R9000, PCR-1000, PCR-2500. Yaesu FTdx1200, FTdx3000, FTdx5000, FTdx9000, FT-2000, FT-1000MP, FT-1000D, FT-991, 991A, FT-990, FT-950, FT-920, FT-900, FT-897, FT-891, FT-890, FT-857, FT847, FT-840, FT-817, FT-818, FT-757GXII, FT-450, FT-100, VR-5000. Elecraft K2 (with KIO2) and K2/100, K3, KX2, KX3. Ten-Tec Jupiter, Argonaut V, Argonaut VI, Orion, Eagle, RX-320, RX-350, Pegasus, Omni VI, Omni VII. Racal 6790/GM, Alinco DX-77, Rockwell-Collins HF-2050, Collins/AOR DDS-2A, DZKit SIenna. Other rotor controllers not listed here support the popular GS-232 or DCU-1 protocols. Added 2D/3D Map Zoom In/Out Contextual menu. Added Keyer @STX Macro TN CUT numbers. DXLab Commander emulation bug fixed. WSJT-X UDP decoder memory bug fixed. Use Mode Groups fixed for Spots panel. If you decide to try the Beta, please report any problems with a debug log and complete problem description. Added Expert Electronics SunSDR2 Pro, QRP, MB1, Colibri Drivers. Added preliminary multiFLEX (V3) support. QSL Via only blue-tags calls with LoTW uploads within last year. Added Reject specific dxcluster spot frequencies. Added Log panel worked/confirmed unique call signs count. Log panel Contextual menu - Add QSO to Selection. Disable Logbook menu selections where prefs are blank. Added DX panel zip code VoiceOver descriptor. Change ADIF export *QSL_RCVDs from V to Y. Added ADIF export CONT (Continent). ADIF MODE export PKT for PACKET not FM. Added CW Keyer speed stepper. Filter out duplicate WSJT-X QSOs. Added snr to WSJT-X CQ spot comment. Log station power if WSJT-X power missing. Removed IC-706 CAT PTT from help files. K6UDA Video Review and v6.08 Review. K4SFC CQ WW WPX SSB Video. LoTW location problem or tqsl problem. Cab-Converter Cabrillo contest file converter. MacLoggerDX V6 must be registered to work beyond the 15 minute time limit. (You can run the 15 minute demo as many times as you like). We encourage you to download the free demo and first make sure that it meets your requirements before you register since we cannot issue refunds. If you have an Amateur Radio call sign, please include it above. Your registration will be emailed to your PayPal email address the same day.